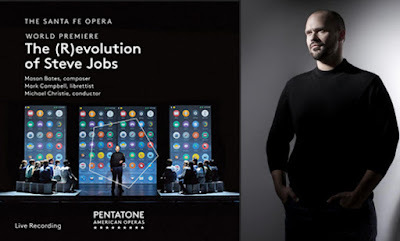 “The (R)evolution of Steve Jobs” by composer Mason Bates walked away with the Grammy Award for Best Opera Recording. The recording featured two barihunks, Edward Parks and Kelly Markgraf, along with Sasha Cooke, Jessica E. Jones, Garrett Sorenson, Wei Wu and conductor Michael Christie with the Santa Fe Opera Orchestra. Daniel Kushner in his "Critic's Choice" review in Opera News wrote of the opera, that it "may well become a staple in the twenty-first century’s operatic canon...it’s the work’s subtle nuances in structure, text and the musical treatment of the characters that are most impactful—and may point to where the future of opera is headed." There are two performances of The (R)evolution of Steve Jobs coming up on the West Coast. The Seattle Opera will perform the piece from February 23 through March 9th with John Moore as Steve Jobs with Nicole Paiement conducting. The San Francisco Opera will present the opera from June 20 through July 3r with Edward Parks as Steve Jobs and Michael Christie conducting.